You’re about to learn 42 Australian English words and phrases to make you sound like a real Aussie. As you may have noticed from last week’s post about Australian signs, I’m in Oz this month! “What’s the most interesting thing about Australia?” I’m sure you’re asking. Well, if you know me, you won’t be surprised to hear that I’ve really noticed how people speak differently here. Australian English is actually pretty different from British or American English. So I did some research and found that there are hundreds and hundreds of Australian English words and phrases, and a lot of them are used every day. So you’ll need to know them to survive here! Positive phrases — Australians are famously relaxed and positive, so it’s not surprising to find a lot of positive Australian words and phrases. Negative words and phrases for people — Australians enjoy making fun of each other. These phrases aren’t so aggressive — just fun ways of pointing out people’s downsides. Jobs — There are lots of Australian words for jobs. Words and phrases about drinking — There’s a big drinking (alcohol) culture here and some great phrases related to it. Places and things — There are a lot of things and places that have interesting Australian names. Clothes — Many items of clothing have special Australian names for them, too. Click to hear the phrases spoken by a real Australian. Bloody ripper — This just means “Awesome!” or “Cool!”. Too easy! — When I heard this for the first time, I was buying a bottle of wine, and the sales guy said it as he was handing me my change. I thought it was a complaint. “Maybe I should’ve made it more challenging for him,” I thought. “I should’ve paid in five-cent coins or something.” Actually, this one just means “Sure! No problem!”. No worries! — This one means the same as “too easy.” This is a classic Australian expression, and you’ll hear it a lot in Oz. Beaut / beauty — “Amazing!” “Awesome!” “Excellent!” — that sort of thing. To give someone a fair go — To give someone a chance or to treat someone fairly. Suss — This one is used to describe someone you don’t really trust very much. It’s a short version of “suspicious.” You can also use it for other things you might be suspicious about, like an offer that’s too good to be true or that website that asks for your bank details before it lets you see that adorable picture of the fluffy kitten. To spit the dummy — You know when kids don’t get what they want? What do they do? They start screaming and running around like mental robots. We often call this “to have a hissy fit” in Britain. In Australia, they say “to spit the dummy.” Why? Because Australians are obviously creative! It’s not just for kids; adults can spit the dummy, too. Drongo — This is actually a type of bird, but Australians use it for someone when they do something stupid, like “Why did you put your laptop on the barbecue, Wayne? You’re such a drongo!” or “You’ve got your right shoe on your left foot and your left one on your right, you drongo!” This is actually quite a friendly phrase. Bludger — Remember Andy? A completely lazy, good-for-nothing couch potato who just expects the world to give him what he needs without him doing anything. That’s a bludger. Andy is such a bludger. There’s something in language called a “diminutive.” If you’ve got kids, you probably use diminutives every day. What is a diminutive? Well, it’s when you’ve decided that a word just isn’t cute enough — so you make it cuter. It can also show the “smallness” of something. For example (and I can’t believe I’m sharing this information with you), my mother used to call me Gaby (pronounced “gay-bee”) instead of Gabriel. Well, Australians LOVE diminutives, and when it comes to jobs, they use them all the time! Truckie — Someone who drives a truck — a truck driver, if you like. Tradie — Short for “tradesman” — a skilled worker. It could be an electrician, a plumber, a carpenter, etc. Garbo — Someone who takes out your rubbish. Or trash. Or garbage. Garbage … garbo? See how this is working? Chippy — This one confused me. That’s because in Britain, a “chippy” is where you go to get your fish and chips, which British people eat every day (not really). But in Australia, a “chippy” is a carpenter — someone who builds things out of wood. This one’s quite creative and probably comes from “wood chips,” which are the small bits of wood on the floor when a carpenter has just made something. Brickie — A builder. But not just any builder. The guy who lays the bricks — or the bricklayer. Aussies love a good drink. They make excellent wine, and beer is very popular. Unsurprisingly, there’s a large number of phrases related to drinking. Amber fluid — Beer! Sounds nice, doesn’t it? Tinnie — A can (or a tin) of beer. Stubby — A small glass bottle of beer. 12-pack (or a 6-pack or a 4-pack) — NOT related to the gym and men’s stomachs. It just means a pack of 12 beers. Esky — A box you can put your beer (or food) in to keep it cool. Otherwise known as a cooler. As I said before, Aussies love to use diminutives for jobs. They love using them for places, too. Servo — A service station. You know, one of those places you get petrol, a coffee or overpriced biscuits. Bottle-o — This is a diminutive for “bottle shop,” which is the place you can buy alcohol. Interestingly, alcohol is quite restricted in Oz — you can’t buy it at the supermarket, and, in some states, bottle shops have strict opening times. Want a can of beer after 5 pm on a Sunday? Too late! Dunny — Toilet! No, I can’t see the connection, either. I’ve just learned to accept it. A dunny is a toilet. Fine. Next, please! Op shop — A charity shop. These are places that sell second-hand stuff that people have donated. The money they make goes to a charity. A lot of countries don’t have op shops, and I think more countries should open some. Everyone wins! Verge / nature strip — This one differs depending on which part of Australia you’re in. You know that little patch of grass between your house and the road? That’s the verge! For some reason, the verge is a big deal in Oz. They have “verge clearance” days, when you can put stuff you don’t want on your verge, and the local council will take it for you. You also have to look after your verge. By law! And don’t ever think about parking on, or even in front of, your neighbour’s verge. They will kill you. Or at least tell you to move. Bubbler (only used in some parts of Australia) — A drinking fountain. You know, those places in town where you can get some drinking water. Australia’s very hot, remember? So these are kind of important, but ugly, things. Trackie dacks — Tracksuit bottoms — the sports trousers you wear at the gym or sometimes at home to be more comfortable. Or what you wear if you’re British and into electronic music. Imagine sports trousers with the 3 lines down the side. That’s trackie dacks. Runners — Sports shoes! “Trainers” in British English and “sneakers” in American English. Those shoes that you run in. It makes sense, right? OK. We’re now entering the swimming zone! Swimming is obviously a big deal in Oz. How do I know that? Because they have a million words (well, at least 6) for swimwear. Sorry — you can’t unsee that now. OK. So you’ve seen lots of Australian English words and phrases today, and hopefully you’ve got a feel for how they work. So now I want you to test your understanding. Can you survive in Australia? Here are some sentences you might hear in Oz. What do the words in bold mean? Did you find this useful? Do you know any people (or kangaroos) that might also benefit from this? Then BE AWESOME AND SHARE! Spread the knowledge! 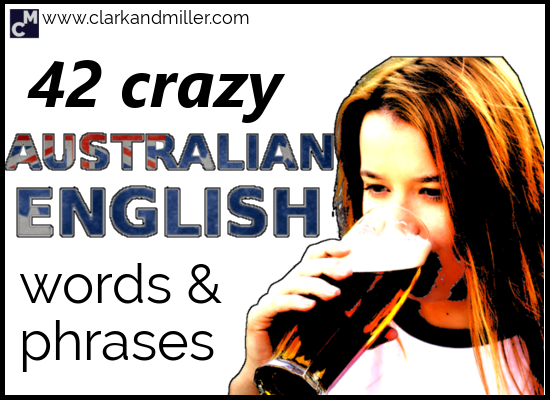 ⟵Can You Understand These 12 Australian English Signs? 6. ? I had to google it! Hmm… now I see! Wahey! Assuming you got number 6 — that’s full points to you! 6. do a u-ie: sorry, no idea. Do it again, maybe? By the way, Clark: Thanks a lot for this wonderful vocabulary. I’ll give you a clue for number 7: it’s something to do with driving…. I see, make a U-turn perhaps? It does, indeed, mean make a U-turn. Hope your weekend was excellent! What about ‘mate’? One of the trickiest Aussie words, I’ll admit, as it can be an insult, aggressive or affectionate. And swearwords, always the most difficult part of any language, apart from jokes, perhaps. Oh, yes — “mate” is a tricky one. Perhaps I subconsciously left that one out! I like the point you make about how a word is delivered and how that can change the meaning. I think that’s a post in itself.